Bangalore-based IBM Research India has a bright idea for keeping discarded lithium laptop batteries out of landfills: repurposing their cells as energy supplies for the powerless. The idea, presented at this weekend’s fifth annual Symposium on Computing for Development (DEV 2014) in San Jose, has passed a small proof-of-principle test run with Bangalore’s working poor. The IBM researchers used disused lithium batteries to create a new device they dubbed the UrJar—a multilingual monicker uniting the Hindi word urjafor energy with jar. Hardware R&D firm Radio Studio, India, built the units. The first phase was tear-down. Radio Studio disassembled laptop batteries to isolate those cells that could still hold several hours’ worth of charge—over 60 percent of cells on average, according to their sampling. Cells that passed quality control were repackaged in a housing with basic electronics [image left], starting with a charging circuit to limit the rate and level of charge on the lithium cells and thus minimize fire risk. Buck converters and a boost circuit feed power jacks for a variety of DC devices including cell phones, LED lights and small fans. At a produciton volume of 100 they figure they can turn out UrJars, including a 3 W LED light and a mobile charger, for 600 rupee ($9.70). 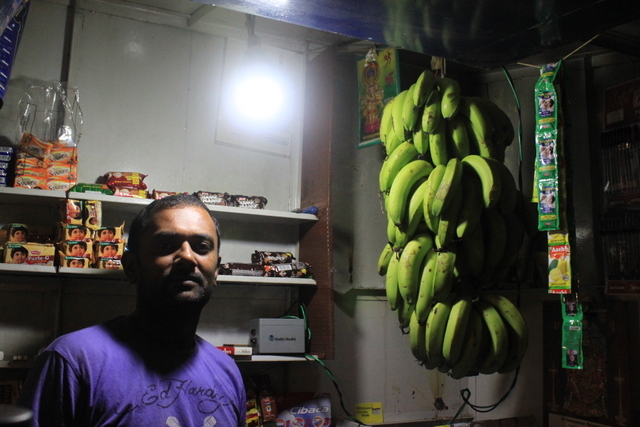 That is one half to one-third the cost of the rechargeable portable lighting devices marketed in Bangalore, most of which use shorter-lived lead acid batteries. Participants in the IBM study reported they would pay 1,000 rupees to own an UrJar. There is certainly no shortage of tossed batteries to fuel this vision. The IBM paper estimates that 142,000 computers are discarded daily in the U.S. alone, while one large multinational’s India operations alone discarded more than 10 metric tons of laptop batteries last year. BBC highlighted India’s growing indigenous e-waste problem in reporting on the UrJar last week, citing one estimate that its IT sector generates 32 metric tons of e-waste per day. That’s a lot of UrJars. Previous Can China Turn Carbon Capture into a Water Feature?